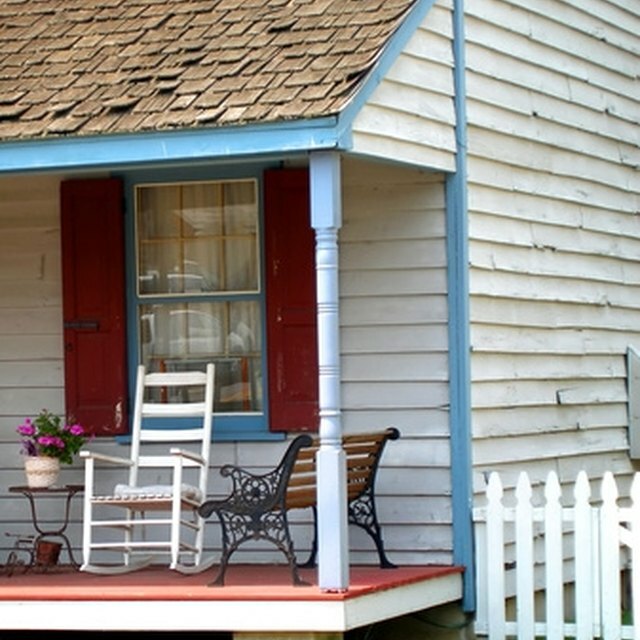 Every exterior door needs a small porch, whether it is covered or not. Stepping onto a floor base keeps the interior of a house much cleaner. Muddy boots or shoes can be left on the porch temporarily as well. While you might not want to invest a lot of time or money in a porch, you can construct a small porch space in just a day or two. Simple decking can make a very handy side porch. Consider using materials that are easy to transport. Pressure-treated lumber and brick pavers are materials you can bring home in a truck yourself. You can find online plans to build a wooden porch with one or two steps, for example. It's relatively easy to install brick pavers on a concrete porch 5-feet square that you pour yourself. Use a step or two from the porch base up to the doorway. This way, the porch itself doesn't have to be deep. A porch that is 5-feet high, say, requires a lot of details concerning support posts. If you build a wooden porch with a couple of steps leading up to the door entry, the porch base might be constructed just 1-foot high at ground level. Install a solid concrete base, if you want to cover the porch later on. You can build a simple porch for now. However, make the foundation deep enough to accommodate porch posts and a heavy roof in the future. Reinforce the porch base, so any added weight later on won't cause a problem. Add style to a small porch with handrails and the door space. If you build a simple, square concrete porch outside a family room, you can enhance it by installing premade railings. A set of double French doors will make the porch look fancier, too. Paint the wood trim and house siding to give the house facade a well-crafted look as well. Create a porch with bricks on sand. If you have a new beach house, for example, you can install a new porch quickly by building it as a removable patio. You can outline the porch with wide lumber boards. These boards will need to be tamped partially into a perimeter "ditch" surrounding the space. Sand placed inside the box will hold bricks laid on top of them in a simple pattern. Level the sand carefully before laying the bricks. Cost Helper: How Much Does a Porch Cost? Judi Light Hopson is a national columnist for McClatchy Newspapers. She is founder of Hopson Global Education and Training and co-author of the college textbook, Burnout to Balance: EMS Stress. She holds a degree in psychology from East Tennessee State University, and has been a professional writer for 25 years.